No one likes having their game crash on them, but it’s gotta be especially painful when you’re in the middle of marathon speedrunning session. That’s what happened to Bl00dyBizkitz in the middle of a platinum trophy attempt in Kingdom Hearts II Final Mix on PS4 (available as part of the 2.5 Remix compilation). Over eight and a half hours into his run, Bl00dy went to save his game for the first time only to be greeted by a CE-37878-0 error code. He immediately closed his eyes, resigned and defeated while the Twitch chat exploded in disbelief. “Looks like you win this round game,” he said. Most of us have been there before. You’re deep into a game, blazing through it with hours of progress under your belt, suckered into a false sense of security because of generous auto-saves and how easy it is to leave games running in the background and come back to them whenever you feel like. Then, inexplicable, your game crashes. It’s 2017, you think to yourself, how are games still allowed to crash? 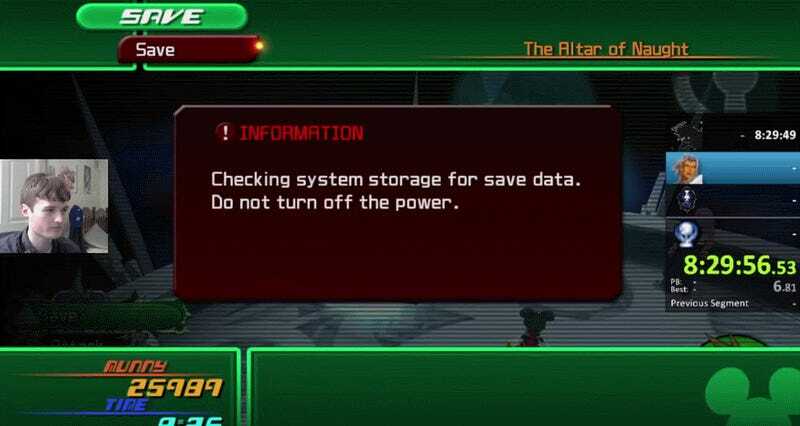 The save crash in the Kingdom Hearts 2.5 HD is a well known bug by this point, at least among the people playing it on PS4. Despite a large, day-one patch from Square Enix when the game was released in March, the problem has persisted, torturing players with its twisted paradox: you need to save often to protect progress but saving the game is the very thing that triggers the crash. Bl00dy is a consumate Kingdom Hearts speedrunner, holding records in a handful of different categories, and was doing the platinum attempt for fun as part of his Month of Kingdom Hearts streaming schedule. But even as many speedrunners utilize glitches in games to try and beat them more quickly, there’s not much they can do in the face of bugs like the above. The game still has a handful of problems plaguing players, including multiple sound issues, but Square Enix hasn’t announced if there are any new patches in the pipeline at this time. You can re-watch the entire speedrun, up until the crash, here.